A conference committee is appointed by the Speaker of the House and the Senate majority leader. The temporary body is comprised of majority and minority members of the committees of jurisdiction for the underlying bill. The conference committee will resolve differences between the versions passed by the House and Senate and produce a conference report. Under ordinary circumstances, a conference report cannot be amended from the floor of either chamber and is fast-tracked for passage. Because the Tax Cuts and Jobs Act is being considered under the rules of reconciliation, the conference report will be subject to ten hours of debate and can be amended during yet another vote-a-rama, during which the bill could change. Generally, the thinking is that the position of the Senate tends to win the day in a conference committee. The passage of the Tax Cuts and Jobs Act in the Senate with 51 votes, with Sen. Bob Corker of Tennessee being the lone Republican vote against the bill, underscores the thin margin for error the Republican-controlled Congress has to get the bill across the finish line. 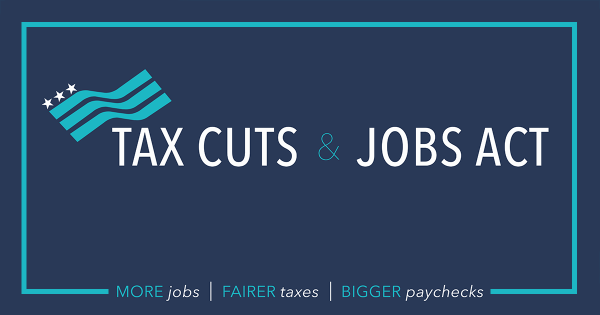 FreedomWorks has maintained that the Tax Cuts and Jobs Act is not the perfect bill. It is a compromise. Because of opposition from Democrats, Republicans have been forced to use budget reconciliation to bypass the 60-vote threshold in the Senate to bypass a filibuster. The FY 2018 budget resolution passed by Congress includes reconciliation instructions that allow for a $1.5 trillion deficit, not including macroeconomic feedback, to produce a tax reform bill. This is the only way to produce a tax bill that can pass the Senate with 51 votes. Any amount over the $1.5 trillion figure will cost the bill its privileged status, and subject the bill to a 60-vote threshold. If the debate over the Tax Cuts and Jobs Act in the relevant committees and on the floor of both chambers taught observers anything, it is that Democrats have no interest in working with Republicans to pass a tax reform bill. The House and Senate have different approaches to individual taxes. The House-passed version of the Tax Cuts and Jobs Act consolidates the existing seven-rate structure into four rates. The Senate version keeps a seven-rate structure but lowers most rates, and significantly adjusts the income levels to which those rates apply. Still, compared to current law, some single and married couples filing jointly in certain tax brackets will pay a higher tax rate under the House and Senate versions. A point of contention between the House and Senate is the timeframe for the individual tax changes. The individual tax rates and reforms last through 2027 in the House version of the bill. Under the Senate version, however, the individual tax rates and reforms expire at the end of 2025. The Senate was under the constraints of the $1.5 maximum allowable deficit under the FY 2018 budget resolution, which is why these changes expire after eight years. Some may be inclined to have a debate to keep the individual tax rates and reforms in place near the end of the eight-year window. Others want to these changes to be in place for ten years. Because the House and Senate versions of the Tax Cuts and Jobs Act eliminate most existing tax credits and deductions, an increase in the standard deduction is key. The House and Senate versions of the standard deduction do not differ too much. Both nearly double the current standard deduction. The Senate version of the Tax Cuts and Jobs Act is more generous with the child tax credit than the House version. Only the first $1,000 of the child tax credit is refundable in both the House and Senate versions. The family tax credit in the House version expires after five years. The phase-out in the Senate version begins at $500,000 for a married couple filing jointly. The phase-out in the House version begins at $230,000 for a married couple filing jointly. Both versions index the child tax credit to chained CPI. The family tax credit in the House is available for each spouse and non-child dependents. There was a push in the Senate by Sens. Marco Rubio (R-Fla.) and Mike Lee (R-Utah) to make the child tax credit fully refundable against payroll tax liability and further address the “marriage penalty.” The proposed pay-for was an increase in the proposed corporate income tax from 20 percent to 22 percent. The Rubio-Lee amendment was defeated on procedural grounds during vote-a-rama. President Trump has expressed a willingness to go above the proposed 20 percent corporatetrade-offax. Although no reason was given, some believe that the White House may be open to a trade off between the corporate income tax and increasing the refundability of the child tax credit. Another point of contention between the House and Senate versions of the Tax Cuts and Jobs Act is how the conference report will treat pass-through businesses. Under current law, some of these pass-through businesses are falling victim to higher tax burdens. Both the House and Senate versions of the bill make significant changes for pass-through businesses -- such as sole proprietorships, partnerships, S-corporations, and limited liability companies (LLCs) -- that are taxed through the individual tax rate structure. The House-passed bill would reduce the maximum pass-through rate to 25 percent. There is a big caveat to this, as the bill also includes limitations to prevent abuse. Tax-writers make an assumption that the 30 percent of income is related to the pass-through, allowing it to fall under the 25 percent rate. The remaining 70 percent will be treated as ordinary income, subjecting it to the regular individual tax structure. Pass-through businesses can seek to have more than the 30 percent of income taxed at the special tax rate, provided they can prove that more income qualifies to meet their circumstances. Professional service businesses -- including accounting and law firms -- will not qualify for the pass-through rate unless they provide proof of business income. The Senate-passed version provides a 23 percent tax deduction for pass-throughs up to 50 percent of W2 wage income. The deduction is available to more service businesses than provided in the House-passed bill. These restrictions do not apply to pass-throughs owned by individuals with a taxable income of $250,000 and joint filers with a taxable income of $500,000, allowing them to take the 23 percent deduction. The version reported by the Senate Finance Committee allowed for a 17.4 percent deduction. Sens. Ron Johnson (R-Wis.) and Steve Daines (R-Mont.) withheld their support of the bill until the deduction was increased. When it became clear that the bill could not pass without their support, an increase in the deduction to 23 percent was included in the final base text, winning Sens. Johnson and Daines’ votes. The House-passed version of the Tax Cuts and Jobs Act lowers the statutory corporate income tax rate from 35 percent to 20 percent, beginning in tax year 2018. The Senate version also lowers the statutory rate to 20 percent in tax year 2019. An argument could be made that corporations have already made decisions for 2018, making the delay until 2019 in the Senate version acceptable to some. Should the Tax Cuts and Jobs Act become law, the top statutory corporate tax rate will be at its lowest rate since 1940, when the top statutory corporate income tax rate was 24 percent, applying to $38,566 or more. Other aspects of the tax treatment of corporations will have to be resolved. The Senate version keeps the corporate alternative minimum tax in place, although with a higher exemption amount. The House version eliminates it. There are differences on the cap on the deduction for net interest. The House version applies to earnings before interest, taxes, depreciation, and amortization (EBITDA). The Senate version applies to earnings before interest and taxes (EBIT). Both the House and Senate eliminate carrybacks for net operating losses (NOL). In the House version, carryforwards are restricted to 90 percent of current year taxable income. The Senate version limits carryforwards to 80 percent. There are other aspects to the tax treatment of corporations that will have to be resolved in conference, including the shift to a territorial tax system, cash accounting, and certain business tax deductions and credits. Separately, the House and Senate are not far apart on the deemed repatriation of overseas profits and assets, which will also have to be addressed. 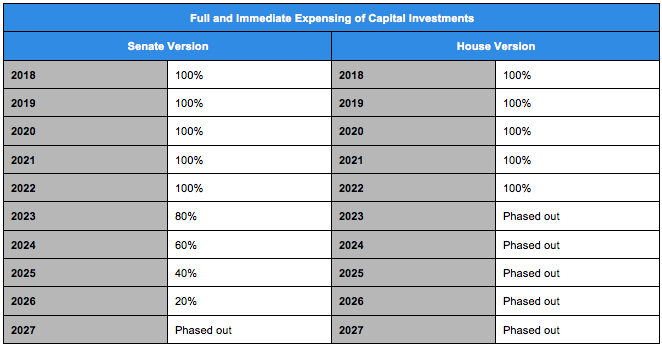 Both the House and Senate versions of the Tax Cuts and Jobs Act provide for the full and immediate expensing of capital investments for five years. Sen. Jeff Flake (R-Ariz.), who initially withheld his support for the bill because of concerns about the impact on the deficit, was able to get a change in the Senate version to phase out expensing through 2027. He believes that this change will make it less likely for Congress to continue the policy of full and immediate expensing in tax years after 2022. The Section 179 cap is increased to $5 million from $500,000 in the phase-outsion and $1 million in the Senate version. The phase out in the House and Senate versions begin at $20 million and $2.5 million, respectively. The House version of the Tax Cuts and Jobs Act increases the exemption for the estate tax, commonly and rightly known as the “death tax,” to $10 million and fully repeals this tax beginning in tax year 2025. The Senate version only increases the exemption to $10 million. Sens. Susan Collins (R-Maine) and Mike Rounds (R-S.D.) expressed opposition to repeal of the death tax. Separately, the Senate version included the repeal of Affordable Care Act’s (ACA) individual mandate, sometimes referred to as the “individual shared responsibility” provision. This is a punitive tax assessed on tax filers who did not have “minimum essential coverage” for three full months or more during a tax year, although exemptions apply. In tax year 2017, the penalty was 2.5 percent of household income or $695 per adult and $347.50 per child, at a maximum of $2,085. The penalty is whichever amount is greater. The repeal of the individual mandate reduces federal outlays by $318.4 billion, as the Joint Committee on Taxation projects that fewer people will purchase government-mandated health insurance plans because of the lack of a punitive tax to coerce them. This decreases the amount the federal government would have otherwise spent on tax credits under the ACA. The House version did not include repeal of the individual mandate because there was a lack of confidence that the Senate would keep such a provision in its final bill. The conference committee between the House and Senate is the home stretch for the Tax Cuts and Jobs Act. Before a tax reform bill can reach the president’s desk, the conference committee has to resolve their differences, produce a conference report, and both chambers have to pass the conference report. Again, the Tax Cuts and Jobs Act is not a perfect bill. Like virtually every piece of legislation passed by Congress, compromises were made to get the bill through the House and Senate and into the conference committee while working within the confines of a $1.5 trillion maximum allowable budget deficit. There is a lot in both versions of the bill to like. There are are some aspects that are frustrating. The goal is to produce the best possible bill under the circumstances, one that lowers individual and corporate tax rates, protects pass-through businesses from a high tax burden, and simplifies the tax code. There is still a lot of work for the conference committee to do. Once a conference report is released, FreedomWorks will provide another update on the final agreement.